THE WEEKLY B-MOVIE NIGHT BLOG: Six Million Lightyears Beyond Believability!! Six Million Lightyears Beyond Believability!! Starring: Danny Lee, Terry Liu, Hsieh Wang. 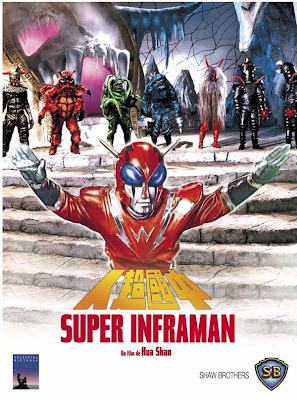 Plot Synopsis: When the nefarious Dragon Princess invades Hong Kong and summons monsters up from the center of the Earth for her army, Earth's meager defense team joins together to create Inframan! With multiple powers at his disposal (including a solar ray and thunderball fists), he sets out to vanquish his enemy forever in the action-packed audience favorite that will have you cheering!